All prices are in Canadian dollars. We use the total number purchased (ELM412P + ELM412SM) for the calculation. The ELM412 is an 8 pin oscillator circuit for driving piezo-electric elements. With the exception of one external resistor, all of the circuitry required to drive a typical piezo ‘bender’ is contained within this chip. This circuit allows the user to select one of eight possible operating frequencies by way of three logic level inputs. These eight frequencies represent some of the more common resonant frequencies used for piezo elements. If desired, the frequency can be continually varied by the controlling circuit. The output of the ELM412 uses a bridge configuration to obtain maximum audio drive for a given power supply level. A single input pin is all that is required to gate the output on and off. 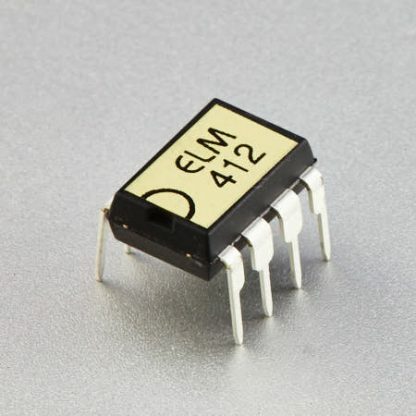 Typically the ELM412 is used to relieve a processor of the duty of waveform generation, allowing it to concentrate on other activities, although the circuit can also be used in stand-alone tone generator circuits.